WARNING to motorists heading into Liverpool. Essential engineering works begin on Monday, 18 March 2019, on Waterloo Road and Regent Road, which require a full closure to traffic for up to 4 weeks, after which a key section will be fully complete. The closure will come into effect from 9.30am between Paisley Street and Blackstone Street to allow for drainage repairs, carriageway resurfacing and critical utility works. Traffic flowing to and from Liverpool City centre will be diverted to use Great Howard Street (A565). Once this phase is over this key section of the dock road will be completed with the scheme entering the final 6 months of an 18 month programme. The next critical phase in the scheme, which began last March (2018) will see works to the route North of Bramley Moore Dock begin later in the Spring. The works, which includes a new cycle way connecting Liverpool City centre to Sefton, are part of a new dual carriageway scheme on the A565 which has been funded by the Local Growth Fund (LGF). Local Growth Funding is awarded to the Liverpool City Region Local Enterprise Partnership (LEP) and invested through the Liverpool City Region Combined Authority through its Strategic Investment Fund. Councillor James Noakes, Cabinet Member for Highways, said:- "The North Liverpool corridor is a hugely complex highways scheme involving an immense amount of engineering works on 2 major roads at the same time. To ensure traffic flows this scheme can only be carried out by a phased approach which means some weeks there are full road closures and some weeks just lane closures. We really appreciate the patience of motorists as these essential works are carried out. Fortunately there are other alternative routes and with this key stretch of the Dock Road complete after this phase we can all begin to see the finishing line and a vastly improved journey in and out of North Liverpool. Of course, schemes of this nature cause disruption but the long term gains of this investment in North Liverpool's infrastructure are going to help redefine our City's economic future." This overall package of road improvements in the North Liverpool area is worth more than ₤100m and is a key element of Liverpool City Council's ₤500m Better Roads programme to invest in the City's highways network. The North Liverpool corridor upgrade, which will complete this Autumn, is seen as crucial to the development of surrounding major regeneration schemes such as the 10 Streets creativity district and Everton FC's proposed new stadium at Bramley Moore Dock and Peel Land and Property's ₤5bn Liverpool Waters scheme. 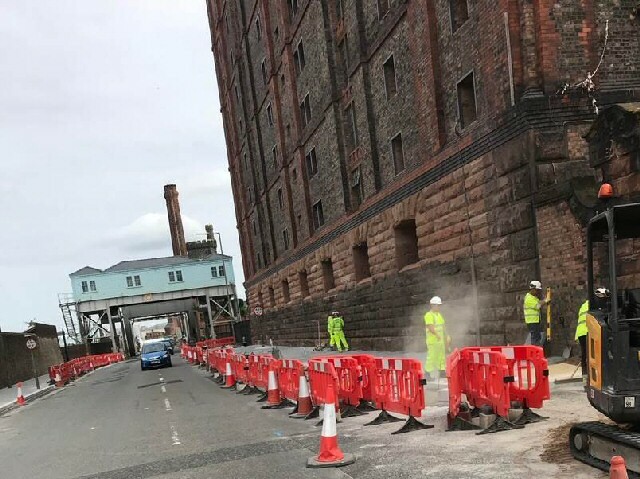 Earlier phases on the A565 scheme included a new bridge, which was designed to support freight traffic for the Liverpool Superport and a new wall to improve access to the historic Stanley Flight canal lock system, which sits within Liverpool's World Heritage site. THE Lewy Body Society, a charity dedicated to tackling the second most common form of dementia, has announced the latest recipients of its grants programme. The charity is awarding 3 grants totalling ₤314,000 for projects at the University of Cambridge, Newcastle University and Imperial College London. These grants take the total research funding issued by the charity to over ₤1 million, since it supported its first PhD student in 2007. All of the charity's funding is received from voluntary donations and earned income, and it receives no statutory funding. The Lewy Body Society is now seeking applications for its next round of funding. The charity will consider any application that is relevant to Lewy body dementia, and applicants from UK institutions can apply for project funding, or to fund PhDs or fellowships. In this funding round, the society has up to ₤500,000 to allocate and will aim to fund 2 to 5 projects. Jacqueline Cannon, Chief Executive of the Lewy Body Society, said:- "Most of our funding comes from people directly affected by Lewy body dementia, through fundraising events, funeral donations and buying Christmas cards and badges. We would like to thank every single 1 of them, as they are making a real difference to improving the awareness and understanding of this difficult disease. Lewy body dementia is the 2nd most common form of dementia among older people, affecting around 130,000 people each year. Yet it is not well known and our clinical understanding of the disease is less developed than that of other conditions. Through our grants programme we are working with dedicated experts across the country who are striving to find better ways to identify and treat the disease in future. We would like to encourage any researchers who may be interested in applying for a grant to get in touch." NHS Trusts across Lancashire are welcoming their first ever nursing associates following a successful pilot programme at the University of Central Lancashire (UCLan). UCLan was 1 of the first universities in the country to run the2 year nursing associates foundation degree and now the first cohort has already been offered jobs across 3 NHS Trusts; Blackpool Teaching Hospitals, East Lancashire Hospitals and Lancashire Care. The pioneering role was developed by Health Education England (HEE) as a new support role to bridge the gap between health care assistants and registered nurses. It focuses on delivering hands on care for patients while at the same time freeing up registered nurses' to focus on more complex clinical duties. Nursing associates are educated in all areas of care including mental and physical health, acute, primary, secondary and community care. The first cohort of students were all already working as health care assistants, allowing them to build on their existing experience and develop their careers. Although a professional role in its own right, nursing associates have the opportunity to progress and complete an 18-month conversion course to become a registered nurse. Michelle McAteer, 49, will be a nursing associate within the Churchtown District Nursing Team near Southport. She said:- "I was already working as a healthcare assistant and was inspired to apply for the course by my daughter who is studying to be a nurse at UCLan. I love working in the community and making a difference. I'll be able to do this even more in my new role through planning care provision and building relationships with people." Terri Tattersall, a 28-year-old newly qualified nursing associate who will work at Blackpool Victoria, said:- "I initially studied geography and it was whilst working in a nursing home during my first degree I realised what my true passion was. I've been a health care assistant for 3 years and jumped at the chance to develop my career. I've really enjoyed the course, especially learning on the job and building on my existing knowledge." Sam Donohue, the national nursing associate lead for HEE, congratulated the students who all began their course in March 2017. She said:- "This role evolved from a report commissioned to look at the nursing workforce over the next 30 years. Nursing associates offer a unique contribution to care, which puts patients at the centre of everything. Because they are trained in so many areas, we're already seeing knowledge and best practise shared across disciplines. With 5,000 nursing associates beginning their careers and a further 7,000 expected to qualify next year, it's a role the NHS really believes in." Head of the UCLan School of Nursing Professor Karen Wright said:- "All of these students are trailblazers and I am thrilled to see them ready to go into many areas of the NHS and make a significant contribution. Being a nursing associate is about being at the heart of the patient journey and taking the time to offer the best care possible." Professor Nigel Harrison, Executive Dean of the Faculty of Health and Wellbeing at UCLan, added:- "This is just the beginning of what will be exciting careers for the nursing associates. It is a pioneering course which we are proud to have developed and delivered collaboratively with our NHS partner provider organisations. We are committed as a University to build on this success as we prepare for our 4th group of students who commence their course at the end of March."